Colorado Springs Planned Parenthood anti-abortion violence. As a physician, I worry about patients. 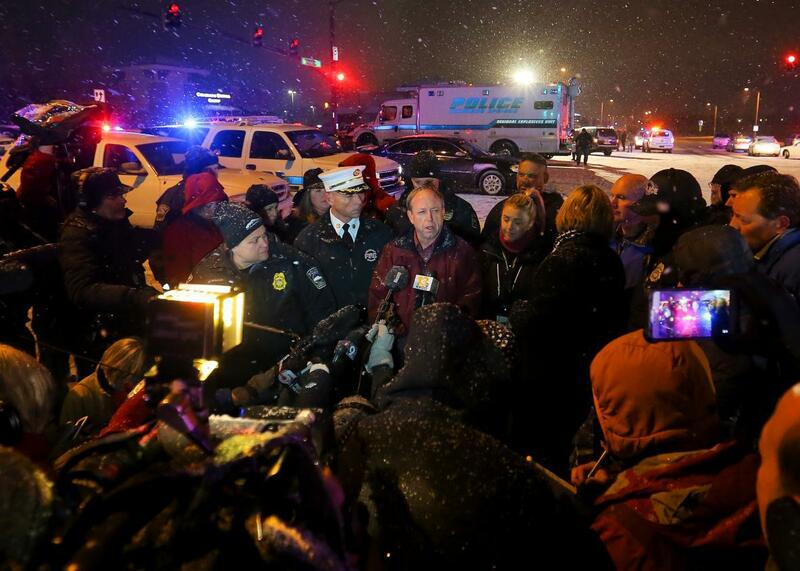 Mayor John Suthers addresses the media outside a Planned Parenthood facility where an active shooter reportedly killed three people and injured nine, on Nov. 27, 2015 in Colorado Springs, Colorado. As news continues to unfold about Friday’s Planned Parenthood shooting in Colorado Springs, one thing is clear: Domestic terrorism remains unchecked, even on the day after Thanksgiving. To label this an isolated act of violence would be naïve. In 2015 alone, there has been unprecedented harassment from anti-choice extremists, including most recently, a series of slanderous manipulated videos used to attack Planned Parenthood’s fetal tissue donation programs. And now this. We can speculate long and hard about the gunman’s motives or targets, but what is more significant—what keeps me up at night as an OB/GYN physician—is the concern that we as a nation have become complacent. Was it truly a shock that something so horrific emerged only weeks after anti–Planned Parenthood rhetoric dominated the presidential candidate debates? What was all of this manipulative campaigning if not an invitation to incite hate? And now this. A few people were injured and only a few people died, some headlines will say. That’s not so many compared to the recent acts of terrorism in Paris. But here’s the irony: This is a homegrown terrorist, one that no amount of passport authentication or refugee rejection could have stopped. We spend all this effort agonizing over external threats, all the while overlooking the extremism, bigotry, and hatred that lives down the street. And now this. This is a sign of crisis. When women are too scared to seek medical care for fear of being shot on the way to clinic, we are in crisis mode. This is beyond bullying and this is no longer simply a politicizing issue. This is a runaway train on which nobody is pulling the brakes. How far does this have to play out before we can stop pretending that abortion care is not real health care? Since 1977, there have been eight murders, 17 attempted murders, 42 bombings, 186 arsons, and thousands of incidents of criminal activity associated with U.S. abortion clinics. These numbers do not include what happened in Colorado Springs. As a physician, I worry about patients. I worry that women will be too scared or intimidated to seek the medical care they deserve and need. I also worry about the men and women who work daily to maintain access to reproductive health care: clinic staff, legislators, advocates. This is the point of terrorism, though, is it not—to incite fear and paralysis? So what then is the solution? The solution is strength and bravery in numbers, and it’s a more accurate depiction of abortion in the media. It’s also government accountability. In 1998, after the shooting of abortion provider Barnett Slepian, the U.S. Department of Justice established a Task Force on Violence Against Health Care Providers. This is the group that coordinates national investigations of incidents like that in Colorado Springs. There are also efforts in place to prevent such tragedies from happening in the first place. The Freedom of Access to Clinic Entrances Act prohibits any violent, threatening, damaging, or obstructive act that interferes with obtaining or providing abortions. These are the laws. How we choose to uphold them, however, is a different story. Anti-choice terrorism can be stopped. When it’s recognized for what it truly is, and when preventing it is given enough support on both sides of the aisle, this can be stopped. As with many critical issues, the first step is often the most difficult—recognizing that there is a problem. We are there now, and we need legitimate, sustainable solutions before this happens again.